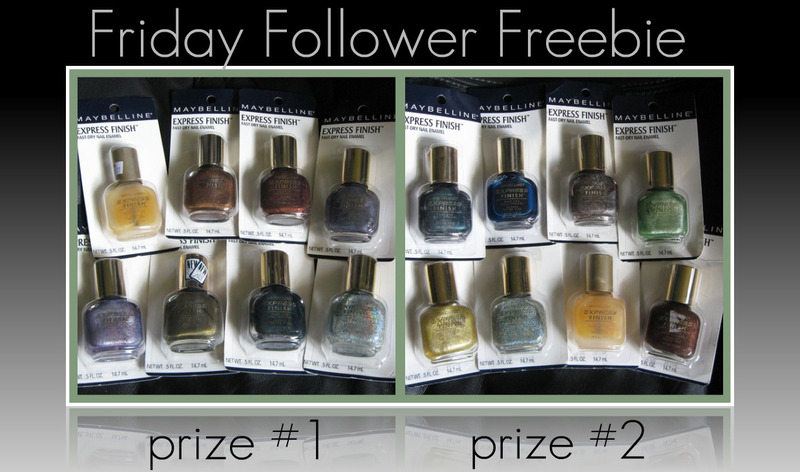 In keeping with the Old School week theme, today's prize features 8 discontinued Maybelline shades and there will be 2 winners. Please indicate #1 or #2 in your entry to make things a little easier! Prize #1 contains: Matte Maker, Blackened Bronze, Bronze Beam, Plum Aluminum, Purple Comet, Khaki Fringe, Blackened Teal, Shooting Stars. Prize #2 contains: Blackened Teal, Blue Water, Brown Aluminum, Lime Aluminum, Gold Aluminum, Shooting Stars, Matte Maker, Bronze Beam. Leave your eMail in the comments section as your entry and indicate if you'd prefer Prize #1 or Prize #2. Contest ends at midnight tomorrow, 9.25.10. Winner will be announced Monday (if they've responded back to their winning eMail notice by then). I'm a follower, enter me please. If I won, I'd like prize #2. If I win, I don't mind which set I'd win, they both look awesome. However that holographic coolness in set 1 looks yumyum! I am a follower! 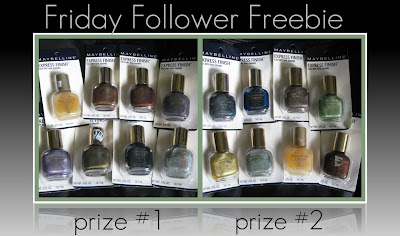 These polishes look great, I would love Prize #1 if I win! Cool! I follow as Smoochiefrog. I'd like either one, but in the effort to avoid looking greedy I'll pick 2. Hi Mary! I'm a follower, and I think #1 looks like an awesome pack! Wow, awesome! I'd choose #1. I am a follwer (Alexa1202) and my email is alexa12_02[at]yahoo[dot]com. Follower here, loving Prize #1! you can reach me at the gmail.com place for email at my userid of bunnymasseuse. I follow you! I would pick Prize #2.
hmm, I love both, but I'd have to go with #2. Cool contest. I like Prize #2 best, but it was really hard to choose. I'm a follower (rebie59) running for prize number 1. This was HARD to choose, but I think I'd like prize #1 a little bit better. Ooooohhhh #1! I've been wanting to get the khaki one! Oh great prizes! I follow as Sisier. thanks for doing all these giveaways! i'd be happy with either, but if i had to choose, i'd say #1! follow via google friend connect: Jessica D.
What a fab giveaway. Prize #1, please! nice colors, so hard to choose ... I`d like to pick price nr 1 if I`m the lucky winner. Prize 2 for me please. Follower on GFC as lisa. #2!!! i have never been able to find Lime Aluminum, and I use Shooting Stars for frankening! I'd be happy with either one honestly, but since I have to choose I'd pick #2.
i'd love to win prize 2!!! I'd love prize #1! :) Thanks! Ooo, I like prize one! follower here, thepieboutique@gmail.com, would love #2! Following under the same name. I am a follower! booteddybelle@hotmail.com. I am not familair with these colors so I'll go with prize pack number 1! I follow as Jane H. via FC. My email is JaneLHoffman (at) gmail (dot) com. Great giveaway! I'm emmajoy in Google Connect. My email address is sheri[dot]goh[at]gmail[dot]com -- thank you for considering me! I would like prize #1 please. I follow! vickers_73460 at yahoo dot com I would choose Prize #1. Thank you for the chance. I WOULD LOVE TO WIN,I PREFER PRIZE NO.1. I AM A FOLLOWER - RUTHIE IZHAR. Hi, I'd love prize #1 - great contest, thanks! I'd love either but I guess I'd prefer prize #1. I follow you as TheRedRibbon. Hi, I'd like prize #1, please. I'd love number 1! Thank you! I'm a follower and would like #1. I'd like Prize 1 very much! Please enter me. My email is kirby.monk (at) gmail (dot) com. Thank you! Prize #1 please! Thank you. Great giveaway! I like them both equally. Please enter me. :) I would love prize #1! I'm a follower (blanche.b at gmail dot com). GFC follower. I would love to win prize #1. Hi, I'm a GFC follower (SusieL). I'd love to win prize pack 1!